With its historic landmarks and buildings, long sandy beaches (Marina Beach of Chennai is the longest beach in India) cultural and art centers and parks, Chennai's tourism offers many potentially interesting locations to visitors. A notable tourist attraction in Chennai is actually in the neighbouring town of Mahabalipuram, with its ancient temples and rock carvings. Chennai has a sparkling sunny weather all year round. It is often rated as one of South India’s bustling metropolises. It is also home to a large number of expatriates. 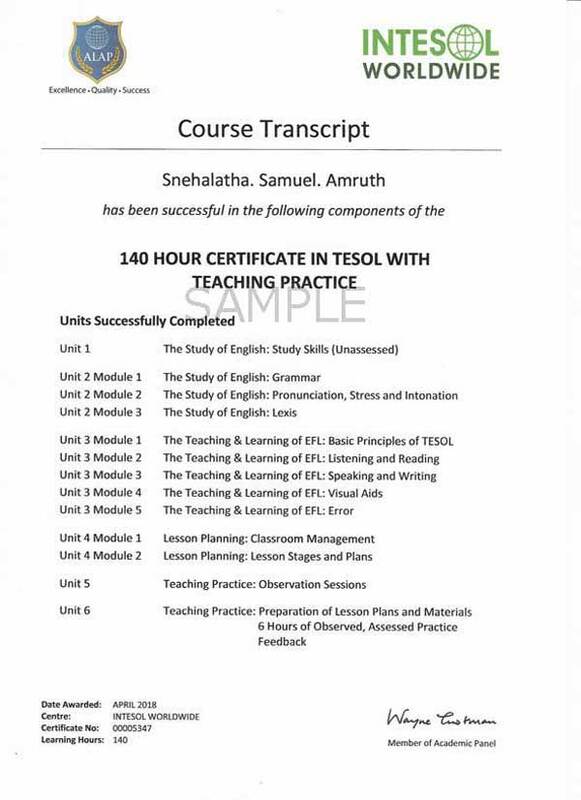 The city is one of the best centres for finishing the TEFL Course with many opportunities. Alongside the desire for becoming a successful EFL teacher in near future, if you possess a heart for something different and a hunger for feeling life deep down inside yourself then you are welcome to Chennai. The city of Chennai is home to not only the most famous temples (Kapaleeshwarar Temple at Mylapore is dedicated to Lord Shiva) but also famous for the major pilgrimage centre for Christians (St. Thomas Cathedral Basilica Church) in India. Chennai’s reputation and legacy as an epicenter for scientific research makes it a place to be, especially for some of the very best thinkers in the world. Its east coast road is a two lane highway along the coast of the Bay of Bengal connecting Chennai with Cuddalore via Pondicherry.Other attractions in and around Chennai also include Cholamandalam Artist’s village, Lighthouse, Sri Ramakrishna Math, Royapuram Fishing Harbour and Huddleston Gardens Of Theosophical Society. Warmers & Micro teaching techniques. It is a classroom training program scheduled for 3 weeks where learning teachers can upgrade their EFL teaching skills and knowledge. You have to be a graduate in any discipline to apply for the course. With this program you could experience practical demonstration of teaching methods. This course can be pursued at a very reasonable fee of 50,000 INR or 735 USD along with course material. Accreditation has an important role to play for the improvements of any educational organization as it deals with quality evaluation and content support. All our courses are globally accredited and certified by Awarding language Acquisition for Professionals (ALAP). This renowned organization is UK based and a supreme institute in the ELT industry, known for maintaining a higher academic quality. 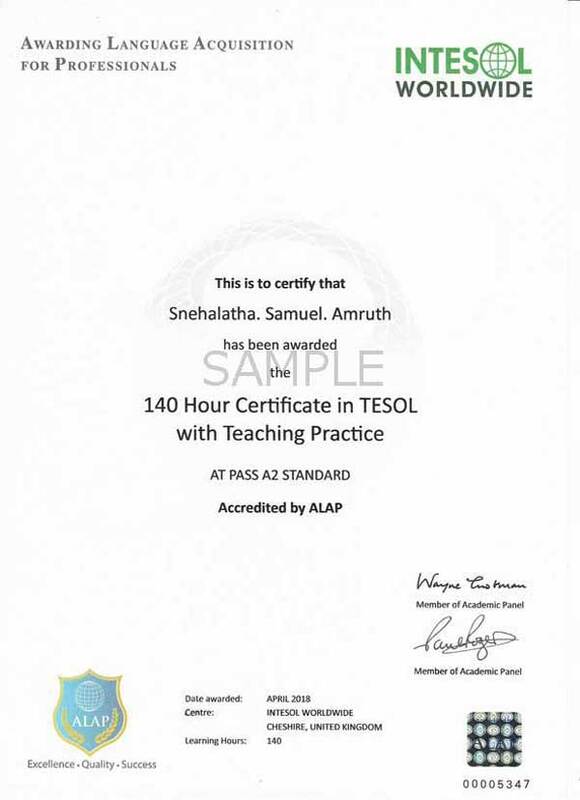 ALAP and INTESOL jointly certifies all the students on successful completion of the course. The certificates feature eligibility to the students for experiencing the real scenario with basic knowledge and credibility. The certificates are globally recognized and are highly beneficial to earn a global teaching career. You will also receive a transcript as the permanent academic report from ALAP that you will not get from any other organization offering similar training in this relative field.